WELLINGTON, FL  February 26, 2004  Topping a class of 66 horses, Beezie Madden, 40, of Cazenovia, New York, riding Authentic for owners John Madden Sales and Elizabeth Bush Burke won the $25,000 PDP Capital WEF Challenge Cup Series Round V, CSI*** today at the Winter Equestrian Festival in Wellington, Florida. Madden was the fastest of seven double-clear performances, claiming victory over a 13-horse jump-off. 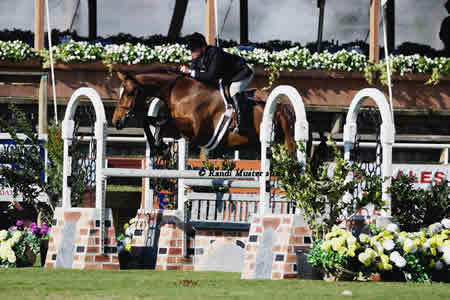 Frances Yann Candele of Schomberg, Ontario, riding Millcreeks Sweet Dream for owner Millcreek Stables placed second. Ian Miller of Perth, Ontario, aboard Promise Me for the owners syndicate The Bakers Dozen was third. Leopoldo Palacious Jugo of Venezuela designed the course. Madden noted that she used different approaches to the fences and took risks that cut time. From fence one to two, I did six strides and McLain did five on his last one, but I bent the six more so I had more foot speed to one and more foot speed to two and because of the line I used I had a quicker line to fence three. Then particularly down by the ingate I took a big risk at the in of the double combination. I didnt set him up a lot for it or give him a big chance to eye it up. He just had to come through and he was great there. McLain Ward with two mounts in the jump-off posted the fastest time at 38.67 aboard his first mount Hurricane but had a rail to take eighth, then tried for the win with Sapphire only to incur a rail in 40.57 for ninth. In earlier competition today, McLain Ward riding Northfields won the Second Year Green Hunter Championship. The Reserve Championship went to Southern Lights ridden by Samantha Conroy. Scott Stewart riding Tribute won the First Year Green Hunter Championship. Tommy Serio aboard Popeyek earned the Reserve. Scott Stewart also won the Regular Conformation Hunter Championship with For The Music. Addison Phillips riding Tinsel Town was the Reserve. Ken Smith in the irons on Storyline won the Regular Working Hunter Championship. Bev Seymour earned the Reserve. Wendy Lewis saddled Forget Paris to win the Adult Amateur Hunter 33 Championship. Caryl Phillips earned the Reserve. 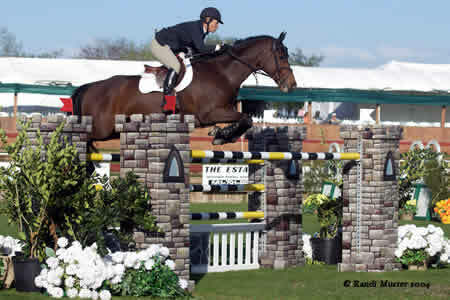 Show days for the 2004 Winter Equestrian Festival are Wednesday through Sunday. Gates open at 8:00 am. Ticket Prices: Wednesdays are free to everyone; Children 12 and under are admitted free every day; Young Adults 13 to 18 and Seniors are $5 on Thursday through Sunday; Adults are $5 on Thursday and Friday, $10 on Saturday, and $15 on Sunday. The Palm Beach Polo Equestrian Club is located on Pierson Road off South Shore Boulevard. For additional information, visit www.stadiumjumping.com or call 561-793-5867.